Luckily, I’ve found at least a partial solution to the problem. I’ve had a chance to play with a pretty spectacular voice recognition application this last week, Vlingo, and I can say without a doubt that I’ve used it in my car more than anywhere else. While it’s obviously preferable that people not tinker with their phones at all while on the road, Vlingo helps make things a bit safer by widening the scope of what voice recognition can do on the Android platform. Vlingo’s been available for other mobile platforms for some time, and recently released their Android version in the Market for the fairly steep price of $9.99. The application has two main features: voice recognition, and a ‘safe reader’ feature that will read your email and text messages aloud. After firing up Vlingo for the first time, you’re met with a fairly attractive, sparse interface that allows access to the two previously mentioned core features as well as some ‘Getting Started’ type tutorials and a few tweakable settings. Overall the application comes across as very well polished, and I haven’t had any issues with crashes or force closes on my Android 2.1 Nexus One. They have also included 4 widgets for you to choose from, 3 of which are just different sizes for quick access to the voice recognition feature, and one that allows you to toggle ‘Safe Reader’ on and off. There doesn’t seem to be a difference in functionality between the 3 widget sizes, but I suppose it’s nice to have the choice. 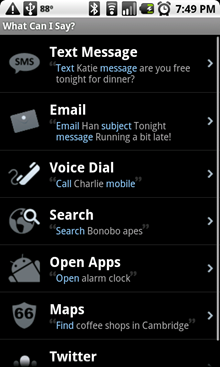 In addition to the widget for quick access, you can also bind Vlingo the search button on your phone – simply hold down the button down for a few seconds, and you should be prompted to either use Android’s built in voice recognition or Vlingo’s, and you can set one as the default. I really like the ability to access the voice recognition no matter what you’re doing. You may have noticed that there’s a bit of overlap between the features Vlingo provides, and those available in stock Android 2.0+ installations – why pay $10 for an app when I can already do voice search, and input text into text messages? 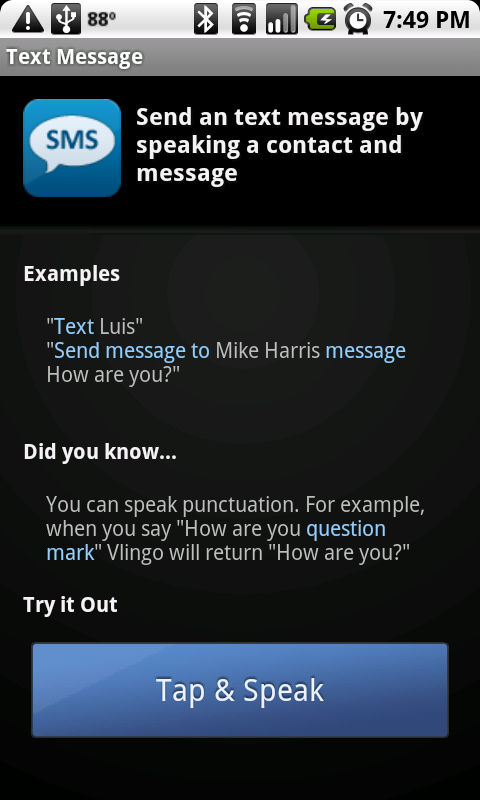 Vlingo proves its value when you realize that when they say you can use the app to send a text message, they really mean you can send a text message using only the application. 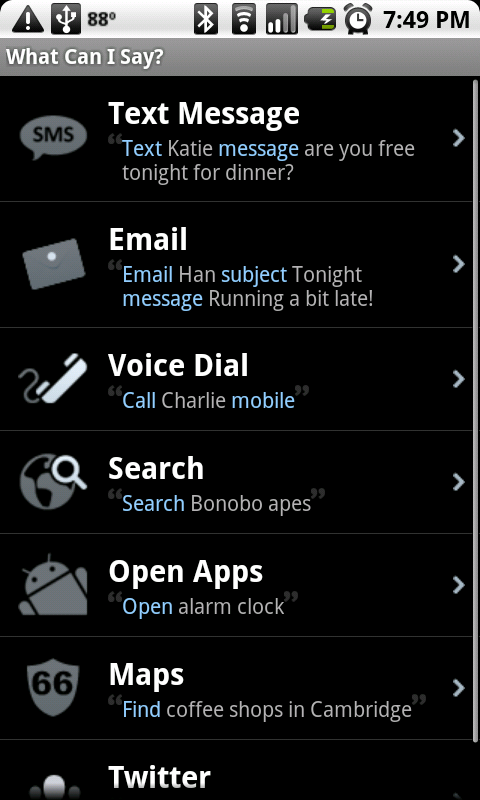 Unlike Android’s stock voice recognition, where you’d normally have to open the messaging app, then find your message thread, select the text field, and then use the voice recognition, with Vlingo you can simply say “Text bob message I’ll be running late tonight” and it will take care of the rest for you. So, the ideas behind the features are solid…but how well do they work? I’m happy to report that I’ve had mostly positive experiences with the voice recognition aspect of Vlingo…with a few caveats. For the most part, it works as described in the above screenshot, but I’ve run in to a few minor snags with it recognizing names, though I can’t entirely fault Vlingo for that. If you take a look at who wrote this post, you’ll see that my last name is Dehghanpoor (pronounced day-gun-poor). It’s a fairly unique name, and most humans don’t even pronounce it properly, so I’m not exactly expecting a cell phone application to nail it every time either – but it did have issues when I attempted to send test messages to my siblings. They do mention that recognition will improve over time, however, so hopefully it will eventually figure out what I mean and complete the action 100%. When it’s not certain whose name you’re pronouncing when attempting to dial, text, or email it will show you a list of your contacts. 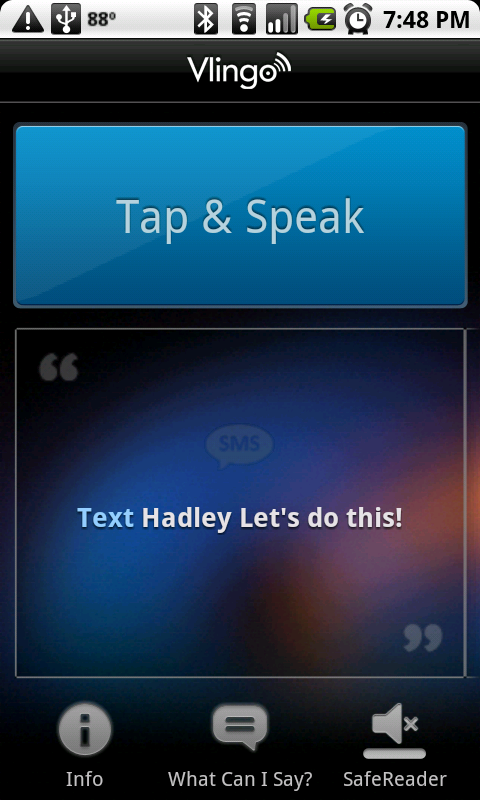 Tapping the contacts name will then go to the desired application with the input field filled with your spoken text. Most other actions performed as expected, with a few exceptions – text wasn’t always 100% accurate, but it was close enough. Usually, if corrections were required they were quick and easy. I also had a few issues trying to use the ‘Open application’ command – I’d say 7/10 times it’d perform a search for the terms ‘Open application’ rather than what I intended to do, so that was fairly frustrating. I’m not sure if Vlingo actually uses Google’s voice recognition backend, but you definitely do need network data access for the app to work, so don’t expect to use it in airplane mode. As I mentioned earlier, I’ve primarily used the application in my car, and it seems to block out music when at a low to medium volume fairly well, though I suspect that may have more to do with the noise cancelling mics on the Nexus One than the application itself. I wouldn’t recommend using it with the windows down, but it should work well enough with some minor background noise. If you need to shoot a quick text or email off in the car, and would rather not risk typing it out by hand, you should be able to do so fairly effortlessly with Vlingo. Not a ton to say about this feature other than it works pretty well at doing what it’s intended to – read your emails and texts aloud. When activated, it will read all incoming texts and emails in a fairly clear, but obviously robotic voice. It performs about as well as I expected it to considering it’s text to speech software on a mobile phone. Overall a useful, but not quite mind blowing feature. While I overall liked Vlingo, I have a hard time thinking of uses for it when I’m not in the car – this may be personal preference, but I can’t imagine speaking commands to my phone in public and keeping my dignity at the same time. Not to mention if you use it to speak a text message, it’d obviously be heard by anyone around you. It may also be helpful for them to include a timer for the ‘Safe Reader’ feature, so that it automatically deactivates after a set amount of time – it may be a bit embarrassing if your phone starts reading a personal text message or email to the entire room. The actual voice recognition performed about as well as Google’s – remember, the big draw of this application are the expanded voice command capabilities, and not necessarily the voice recognition itself. So that said, I still have issues with it understanding some of the more complicated last names in my address books, and it does occasional mishear a few words in some of the text and emails I’ve sent, but that’s to be expected. Then there’s the price point, $9.99. For an Android application, this is fairly steep, and for me, I don’t think I was able to get enough use out of the application to justify the price. Ideally, I’d like to see it priced at $3.99-5.00, but I’m not sure how likely that is to happen. Now the good news - we have 25 Vlingo licenses to give away ($10 value each) to our readers. Make sure you follow us (@AndroidPolice) on twitter. Optionally, you can also follow @Vlingo. Post a comment here suggesting a feature Vlingo should work on next, no matter how crazy or unbelievable. What would Vlingo be able to accomplish in the ideal world? Don't forget to Include the url to your twitter account or tweet in your comment here, either in the Website field or as part of the comment body, so that we can match the tweets to the comments. The most original 25 suggestions will get a free Vlingo license. Contest starts immediately and runs until Thursday, June 24th, 11:59PM PST. Winners will be posted here and notified by twitter or email.